Prosciutto grissini is a simple yet elegant way to incorporate a prosciutto appetizer into your next dinner party. The creamy prosciutto-wrapped breadsticks will turn a dull cheese plate into an extraordinary surprise for all of your guests – they’ll surely be asking for the recipe. Try a smooth Sauternes Bordeaux wine with this prosciutto appetizer to balance sweetness and saltiness or try a heavier stout beer to compliment the truffle butter and prosciutto. Combine butter and truffle oil in a small bowl. Season to taste with salt and pepper. Spread cheese on a plate. With a butter knife, spread each grissini with the butter mixture 3/4 of the way up. Roll each stick in the cheese to coat. 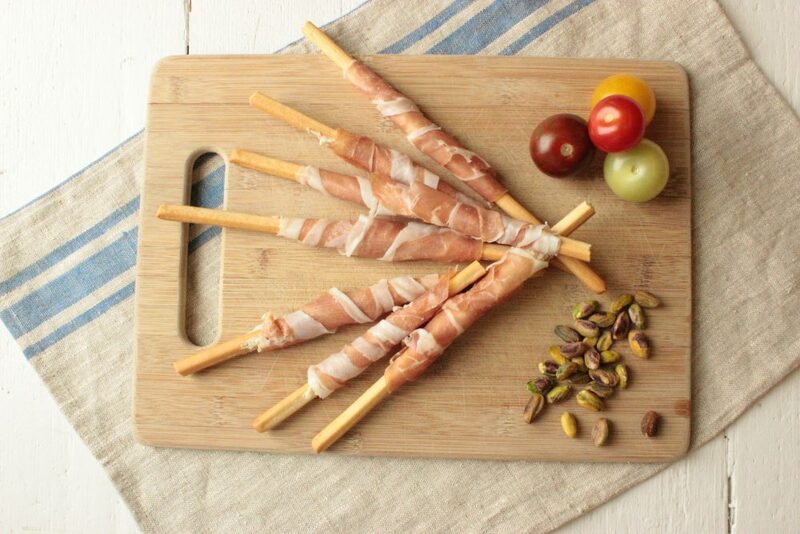 Wrap each with a slice of prosciutto. Serve immediately.